There are many formats of label stock available for the different printers currently on the market. As well, there are many printing methods available depending on the printers you choose. This document will not be getting too involved with the printers or the print methods. The purpose here is to ensure that you purchase the correct stock for your printing needs. Because your choice of stock can create some limitations on how you print and how many labels will be printed each time you print. One big consideration is how many labels you usually print at any given time. - If you generally print large runs of labels, chances are the most economical labels would be the full sheet labels, which you can print on your Laser or Ink Jet printers, so there isn't any need to purchase any new hardware. This method however is not as economical if you tend to print small runs or one label at a time. If you usually print only a few labels, or one label at a time, then you will probably be using a dedicated bar-code label printer which accepts rolls of label stock. These rolls come in several different formats as well, and depending on the printable width of the print head (usually 2“ wide or 4” wide), can print 1, 2 or 3 across labels. For most users a 1 across label is the best choice. This way you can print as many or as few as you need, without having any extra blank labels. If you decide on a 2 or 3 across label, then you will always have to print multiples of 2 or 3 labels. 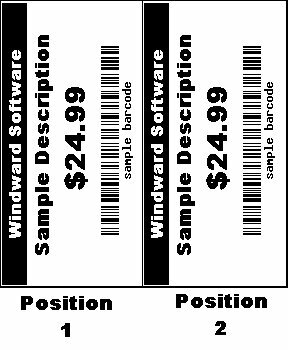 This limitation exists for code based labels.In this case you always have to be aware of how many labels you are printing, as it will always have to be a multiple of how many labels across your stock is. If your label stock is 3 across, then you will only be able to tell the printer to print multiples of 3 (3,6,9,12, etc. ).in the case of a PO that contains multiple inventory items, the total number of labels (determined by the quantities of the items on the PO) must be a multiple of the number of labels across of your label stock. If it isn't, it will print most of your labels, but when it comes to the end of the print job, you will get an error if your stock is 3 across and there are only 1 or 2 labels left in the print job. Similarly, you can print multiples across with the System Five Label Designer. However we have the built in ability to avoid sending the printer into an error if the labels printed are not a multiple of the number of labels across the stock. 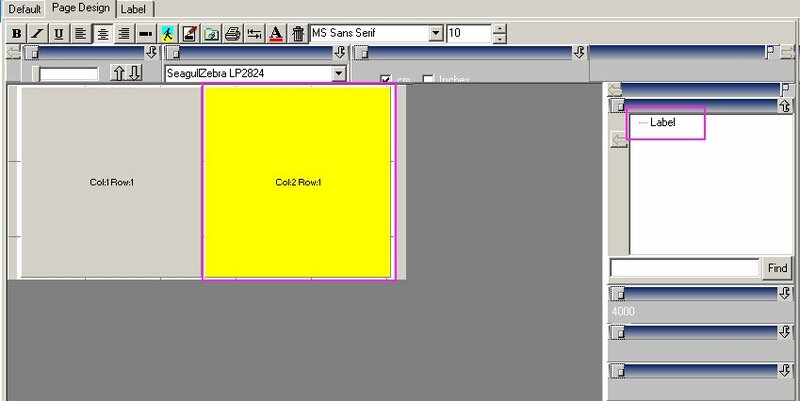 If you design the label in the System Five Label Designer, and you are printing labels from a PO, or from the inventory item. If you are using a 2 across label and you request to print 5 labels, the printer will print 5 labels plus a blank one. Similarly, if you are using a 3 across label, and you want to print 4 labels, System Five will print 4 labels and 2 blank. This is unavoidable. 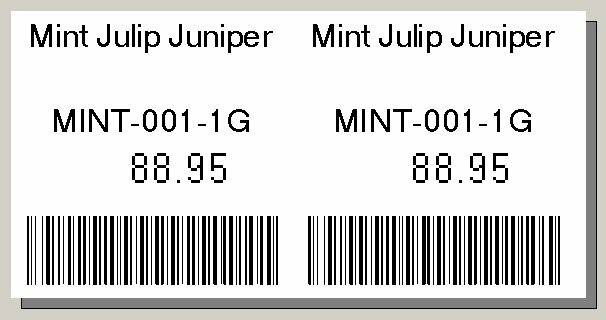 However, from within a PO, if you print labels for all the items, then System Five will continue to print all the labels according to the the quantities on the PO. In this case, you should only see one or two blank labels at the end of the print job, if the total quantity of labels printed are not divisible by the number of labels across (2 or 3). First you will need to set up the label width (entire width across all the labels) in the Windows Printer Driver for your printer. If you are using a 2“x2” label and it is 2 labels across, the printable width of the label should be 4“ wide. So you want to set your stock size to a 4”x2“ label size. in the System Five Inventory Label Designer, you will need to create a new label, and select your label printer. then in the designer window, click on the printer setup, and make sure that your label stock is set to the width across your label, and not the actual label size. As mentioned above, you would set it to 4”x2“ instead of 2”x2“, because we will be setting the individual label sizes in the designer to be 2 across. Apply this setting, and you should now see an approximation of the label size in the label design window. You can now zoom in using the slide bar at the top of the page. Now click on label. and drag it into the label window. Re-size it to roughly half the size of the label. Now click on Label again, and drag a second instance of it into the label window. re-size it to fill the remainder of the window. Now click on the label tab and you will see only one of the labels you defined in the previous steps. This is because the designer sets this one label's design to be the same for both labels. Now you will need to create the fields you want on the label. This is done by finding the field names in the list on the right hand side of the screen and dragging them into the left hand window, then resizing the fields to look the way you want it. The printed label is shown below. While colored label stock can draw attention to the label, it can have a big drawback as well. If you are planning to put barcodes on your labels, you will need to stay away from any mid to dark colored stock. This is because the barcode scanners are designed to read black markings on white stock. So the scanner will not be able to differentiate between the black print and the colored stock. Some colors to stay away from would be Dark Greens, Reds, Browns, Blues, etc. Light colors like Yellow, Light Tan, Light Gray, or Light Pink should work OK. An easy way to tell is to test by putting one of those colors on a photocopier and make a black and white copy. IF it barely shows up on the photocopied image, then it will be ok. If it comes out Gray it MIGHT work. But if it comes out Dark Grey or Black, it won't work. 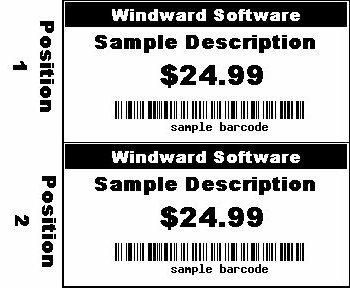 We will not be discussing code based labels in this document, as it is fairly involved, and it is recommended that you contact your Windward Sales Representative to discuss having one of our techs assist you with this process. However here are a few links that you may find helpful if you want to attempt creating code based labels on your own.